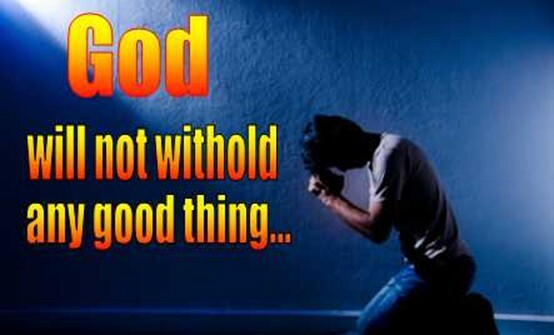 I will do for you what you will believe Me for and what you will receive, says the LORD, for I will not withhold anything good from you. What I say, I will do. I DO ALL THINGS WELL and I will do all things well for you. Nothing is too big or too small. I know where you are and know your need before you ask or petition Me. I Am a can do, and yes God. I will grant the desire of your heart as you come to Me as a child in simplistic faith and trust in Me at all times and expect that I Am the grantor of your desires. I said I will honor My Word. Know My Word and believe it. Speak it and it will become your tangible reality. I have already answered everything and all that you need is on the table that is spread for you in My presence. Come to Me in My presence and receive the fullness of My Joy and eat and drink at My table. Everything is there with no missing elements. I have much more for you, My child. It is already there. Come and get it! Come and dine. Come and drink until you are fat and full of My blessings upon blessings upon blessings. For all that I have is yours. Look to Me and look away from your concerns. See that I Am your all in all. I will save the lost, restore health to you, revitalize you, energize and engage you into your full destiny and purpose in Me in My kingdom. PRESS INTO ME and let Me press into you LIFE AND PEACE AND UNSPEAKABLE JOY that abides as you refocus your attention upon Me and MY Word and BELIEVE what I have spoken, Am still speaking and will speak. I honor My Word, and as you stand in unwavering faith in Me, I will honor your word too as it aligns with Mine and we become one in purpose and thought and the works that I do according to My WORD and MY WILL shall be done as you see they are inseparable. Be ONE with Me, says the LORD, and walk in Me and believe that I Am your shield and exceeding, great reward. That is what I said. That is Who I Am, and that is MY will, and that is what I do and will do. I will perform My WORD in your life and the lives of those you love by continual agreement and alignment with ME and My Word. Let faith arise and let your mouth speak and then you will be a doer of My Work, and the things that I do, you shall also do, and you will see My word in action and completion in your life as it comes to pass, says the LORD. Amen!!!! I receive this for my husband and I. Thank you Father. Ameeen !! glory be to God !!! Yes Lord you know my thoughts.I. look up to you in times of needs .You are my Everything.